You’d think that a story about an origami Yoda would be a first, right? Well, the world being what it is today, it turns out that our very own Lambert Varias wrote about an origami Yoda last year. But I think this one has got the original beat like Yoda beat down Darth Maul – so take that, Lambert! This detailed Yoda sculpture was hand-folded out of a single sheet of paper by James Lucas, based on a design by Fumiaki Kawahata. How can that be one sheet of paper, you ask? It’s actually a sheet of tissue-foil paper with green on one side and ivory on the other, that’s how. Yoda stands about 6″ tall, and is covered with a layer of waterproof spray lacquer, which should keep him in good condition – though I still wouldn’t leave him out in the Dagobah swamp for long. 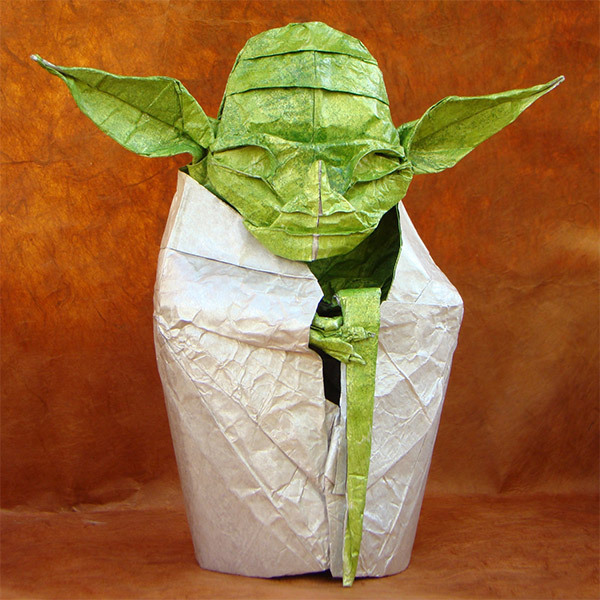 Order origami Yoda over on Etsy for $55 (USD) you will.